Photographer Karla Bernstein and author and painter Cortney Davis have an exhibit of photographs and acrylic paintings, Abstractions, at G&B Cultural Center, opening Sun. April 22, 2-4 and running through May 30. Bevi Bullwinkel had her piece Dawning (2018, water-mixable oil on canvas, 24x24, at right, click for larger image) juried into the Carriage Barn's Spectrum show (Through May 24; Wed-Sat 10-5; Sun1-5pm). Bevi says the work was influenced by the 2017 solar eclipse, which, for her, invoked the feeling of a new day, a new age, a light emerging--a dawning. Bevi also received the Hu Lindsay Memorial award for her painting "Dancing," which won First Prize for mixed media at the Rowayton Arts Center's Abstraction show. Joan Wheeler has 11 paintings in "Inside Outside" at the Color Blends Pop-Up Gallery, 893 Clinton Avenue, Bridgeport, through May 14 from 10-4pm. Included are Lifeblood (oil painting on wood, 14x11, detail at right), an anatomical depiction of a hand supporting the root system of a glorious flowering plan, illustrating the interconnection of man and the natural world; and Creative Vision (oil painting on wood, 14x11), an anatomical depiction of an eye acting as a flowering bulb. The Carriage Barn Arts Center is seeking artists to showcase their artwork in New Canaan store windows and participate in a downtown celebration of the arts: Art in the Windows, 2018. New Canaan’s premier retailers are participating in this annual event, which promotes local artists and benefits the Carriage Barn Arts Center, home of the New Canaan Society for the Arts. Please take into consideration that store space is limited all submissions may not be exhibited. Typically, a store window can accommodate 1 – 3 smaller pieces of art. A limited number of stores can display large scale artwork. Any medium is welcome, including small sculptures. There are no substitutions once works for the exhibit are chosen. The designation of artwork in the stores is at the discretion of the Director and the Art in the Windows committee. Artists receive 50% and 50% supports the New Canaan Society for the Arts. There is a special youth category for artists ages 5-16. Selected works will be displayed in designated store windows or in a special youth gallery in town. Artists will have the opportunity to participate in one or more special events, hosted in conjunction with the New Canaan Chamber of Commerce, with receptions taking place at various retailers, restaurants and locations around town. A maximum of 3 works per artist will be accepted for a non-refundable fee: $21 for up to 3 entries (Youth/Student: $21; Non-members: $36) Become a member here. Full prospectus here. The Darien Arts Center is announcing the return of its smartphone photography contest fundraiser, Pic Darien. In 2017, the contest garnered over 300 entries, with submissions from all ages. This year, contestants may submit their smartphone photos for cash prizes in 6 categories at darienarts.org until May 16th. The contest is open to all; there are no age restrictions and contestants are not required to live in Darien. Participants may enter either as a student, age 17 and under, or as an adult, age 18 and over, in one of six themed prize categories including People and Pets, Landscape and Nature, Travel: Near and Far, Food, Humor and Abstract. Fee to enter the contest is $10 per photo. Contestants may enter multiple times. First place and honorable mention cash prizes will be awarded to students and adults in all categories. First place prizes are $100 and honorable mention prizes are $50. Award-winning photographer, filmmaker, and TV producer Jeffrey Wyant, will judge the show, which is sponsored by Nola Physical Therapy and Performance, E.C. Scott, Blue Wave Taco, Blue Wave Orthodontics, Big Shots Custom Framing and Photolab and Beautycounter. An Award and Reveal Reception open to the public, with refreshments and a slide show of all photo contest entries, will take place at the DAC Weatherstone Studio on Friday, June 1st. To find out more about the Pic Darien contest, visit darienarts.org or call (203) 655-8683. The DAC is located at 2 Renshaw Road, behind the Darien Town Hall. Enter here. The Westport Arts Center announces its Call For Entries for SELECTS 2018, its twelfth annual summer member artist exhibition. he exhibition will be juried by Joe Amrhein and Susan Swenson of Pierogi Gallery (NYC), arguably known as one of the most prominent established galleries dedicated to emerging artists. Joe Amrhein is the co-owner/director of Pierogi Gallery (NYC) and The Boiler (Williamsburg, Brooklyn) and Susan Swenson is co-owner of Pierogi Gallery and co-founder and editor of Pierogi Press. Amanda Innes, the Westport Arts Center’s Executive Director, commented, “Within the world of contemporary art dealers, Joe and Susan stand out for their dedication to representing mid-career and emerging artists. As a result of their commitment to working artists, Pierogi’s loyal following of collectors and curators seek out their installations at Basel, Frieze, and The Armory art fairs, in addition to their gallery locations in Brooklyn or the Lower East Side,” The member exhibitions are one way in which the Arts Center celebrates the artistic talent and diversity of its artist members. Now in its twelfth year, the summer member exhibition is designed to discover and showcase new works of art by talented artists in the region, and also helps new artists discover the Westport Arts Center. SELECTS 2018 will feature up to ten artists. Members only can apply; membership is available here. The entry fee is $45. Painting, drawing, video, sculpture, ceramics, printmaking, photography and mixed media are all eligible for submission. Full submission guidelines are available here. The Arts Center will notify all artists on May 23, 2018. SELECTS 2018 will be on view beginning June 22. 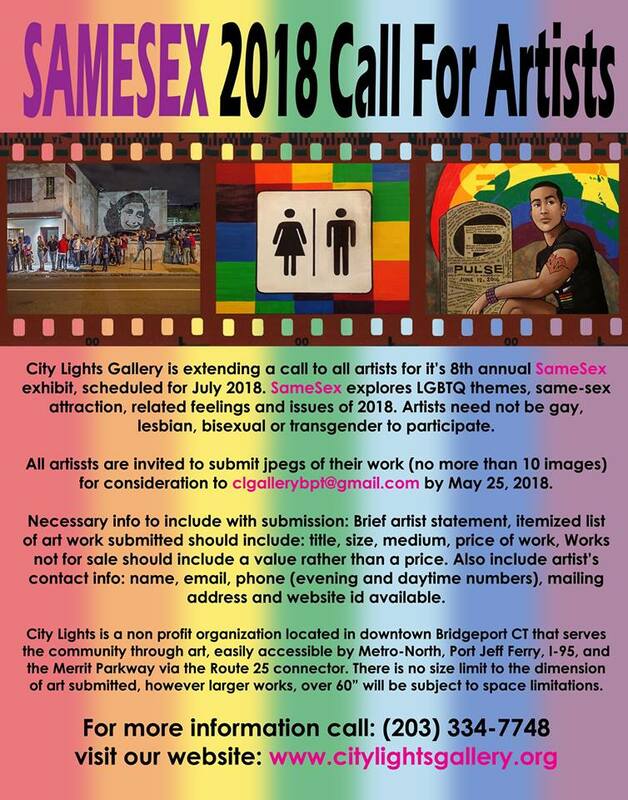 For any questions on eligibility, submission guidelines or the upcoming exhibition, please contact the Westport Arts Center at 203.222-7070 or visit westportartscenter.org. The Carving Studio and Sculpture Center offers unique sculpture education programs amid inactive quarries and former manufacturing facilities of the Vermont Marble Company. Since 1987, sculptors, students and connoisseurs have traveled to West Rutland, Vermont to draw inspiration from the native marble and the creative spirit that lingers from the once-global industry that thrived here. The Center invites artists to submit proposals for SculptFest 2018, Sept. 8-Oct. 21. The theme for this year’s outdoor exhibition is interdependence, guest curated by Alisa Dworsky. Ms. Dworsky is an artist and architectural designer who lives and works in Montpelier, Vermont. Interdependence reflects a form of symbiosis, the interaction between two or more elements for the benefit of all. The concept of interdependence can serve as a lens to understand the relationships within natural systems and between people, industries, nation-states, structural components and abstract forms. Artists responding to this call are encouraged to think across and between creative disciplines and media. Sculptors, installation artists, sound artists, video artists, web based artists, performance based visual artists, and multimedia artists are encouraged to consider applying. See the website for more on the history of the grounds as a former marble quarry, www.carvingstudio.org. Proposals should include: a one-page project description, sketches, photos or other visual representations of proposed project; artist’s resume; up to 10 images of previous works (emphasis on site-specific); artist statement. Applications are due Friday, June 22nd, 2018. Please mail proposals to “SculptFest 2018” The Carving Studio & Sculpture Center P.O. Box 495, West Rutland, VT 05777 or email to info@carvingstudio.org (each image must be in jpeg format, under 1MB, text documents in pdf format, videos may use website/YouTube/Vimeo links). The CT Office of the Arts has announced a Webinar on the above grants on Weds. May 8, 12-1pm (details still to come). Remember: Artists can apply for a CT Office of the Art Project Grant ($5-15,000) - or Regional Initiative Grant (REGI; $1-4,000) - either with a fiscal sponsor (such as NYFA, Fractured Atlas or other 501(c)(3) cultural nonprofit) or through their own legal entity. Or they may seek to work with a cultural nonprofit (or municipal department, school district, college or university) as part of a project, as every project has to engage at least one Connecticut artist. Discuss project ideas with cultural nonprofits and be one of the artists they work with. Project Grants support "arts-based projects of artistic excellence for Connecticut audiences, communities and participants and that are accessible and relevant to the audience and community it is designed to serve." REGI Grants are designed to encourage and support small community arts-based projects and are perfect for engaging in a specific community matter, reflect on personal experience, and/or projects that bring neighborhoods together. An informational webinar will be available in early May. The application deadline is June 6, 2018. The Guidelines are available here. The Arts Writers Grant Program is open emerging and established writers who are writing about contemporary visual art. Ranging from $15,000 to $50,000 in four categories—articles, blogs, books and short-form writing—these grants support projects addressing both general and specialized art audiences, from scholarly studies to self-published blogs. The grant also supports art writing that engages criticism through interdisciplinary methods or experiments with literary styles. Writers who meet the program's eligibility requirements are invited to apply in the following categories: Articles; Blogs; Books; Short-Form Writing. It is recommended that you read through the Application Guide before filling out the online application. Eligibility requirements and writing sample submission word counts vary for each project type. You may only apply for one project per grant cycle. You must choose one project type: Article, Blog, Book, or Short-Form Writing. You can see the application questions here. To receive updates on the Arts Writers Grant Program, follow @artswriters on Twitter. The New Art Center, Newton, MA, is a community art education space that offers everyone, at all levels of ability, exceptional opportunities to make, exhibit, view, think about and talk about art. The Center offers a supportive culture, serving over 2,500 students annually in hundreds of classes and workshops. It offers an inclusive, multi-generational approach to art education that has served children, teens and adults at all skill levels since 1977.The New Art Center's mid-sized nonprofit exhibition spaces attracts over 4,500 visitors annually. Its Curatorial Opportunity Program is well respected in New England’s visual arts community. and is a unique vehicle for curators and artists to collaborate and present thoughtful, innovative concepts. The New Art Center is currently accepting proposals for its Curatorial Opportunity Program. The program investigates contemporary culture through the visual arts. It makes possible diverse curatorial visions in a collaborative, non-profit and alternative exhibition space. Curators of selected group exhibitions receive a $1,000 stipend and administrative, promotional, and technical support. There will be a Curatorial Opportunity Program Workshop and Info Session with Jamin An & Jen Mergel on Wed. April 25, 2018, 7-9pm. The New Art Center has a 35-year tradition of using its Main Gallery for group exhibitions curated by an independent curator. Since 1991, we have continued this tradition through our Curatorial Opportunity Program’s public call for proposals. The New Art Center considers COP proposals for exhibitions involving two or more artists, featuring a strong curatorial concept and incorporating at least one public program. COP exhibitions are installed in our 2,500 square-foot main gallery space. Two COP exhibitions are presented annually. The deadline for this year’s call is Tuesday, June 5, 2018 at 5PM EST. Electronic submissions only through Call for Entry. Access the online application here. The Bennett Prize and Residency, created in 2018 by art collectors Steven Alan Bennett and Dr. Elaine Melotti Schmidt at The Pittsburgh Foundation, awards $50,000 to a woman artist to create her own solo exhibition of figurative realist paintings, which will travel the country. The Prize will propel the careers of women painters who have not yet realized full professional recognition, empowering new artists and those who have painted for many years. The Prize will expand opportunities for the public, who may not be familiar with figurative realist painting, to learn more about the creative vision of talented women painters in this increasingly popular genre. A qualified applicant is: a living woman and a fine art painter who applies paint to a generally two-dimensional surface; a figurative realist painter, painting in the style in which the realistically depicted human figure, or figures, is central to the work; is pursuing a career as a full-time professional painter, who has not yet received significant professional recognition - meaning the artist has not sold any single work of art for, nor has received an art prize or award, in an amount exceeding $25,000. A $50 entry fee will be charged to all entrants. Artists may submit artwork of any size for jury consideration but, the largest dimension of submitted work for the exhibition cannot exceed 72 inches. The Bennett Prize winner makes the following commitments in writing to receive The Bennett Prize: to pursue figurative realist painting on a full-time basis during the Residency (the winner may pursue non-art, part-time work); to produce at least five completed paintings annually during the Residency, unless an exception is made by The Prize Committee; to use the proceeds of The Prize for lawful expenses only; to permit The Pittsburgh Foundation, The Prize Committee or any representative designated by the Foundation to visit the winner’s studio from time to time to evaluate progress. Click here for full call for entries. generate revenue, and provide opportunities for other forms of support; with other Museum staff, guest curators, and designers, develop interpretive materials for new exhibitions; serve as the Museum’s public face within the history education community through professional leadership activities, committees, and affiliations. A full position description is available here. Send cover letter, resume, and a list of three references search@newhavenmuseum.org. Review of applications will begin immediately and will continue until the position is filled. No phone calls, please. EOE. Arts for Healing, New Canaan, seeks an Art Therapist/ Adaptive Art teacher to provide art therapy (or adaptive art lessons) to individuals or groups of children and adults in our clinical settings to clients with autism spectrum disorder, neurological dysfunction and developmental and/or cognitive disabilities, including Alzheimer's. Would also: work with outreach groups in local schools, camps, group homes, senior centers, community centers, hospitals; have the ability to collaborate with music therapist in a theater program to create scenes, props, costumes, etc. ; complete client and program data sheets, as well as reports on client sessions and progress as required. While client services are the first priority, all staff may be expected to represent AFH at events throughout the year. Be a team player in clinical settings and all aspects of organization: show a true dedication to the mission. Other Requirements: Masters in Art Therapy or Creative Arts with certification. ; qualified to supervise a student intern. ; experience working successfully with special needs children and adults. Personal transportation required to travel to outreach locations. Apply here.